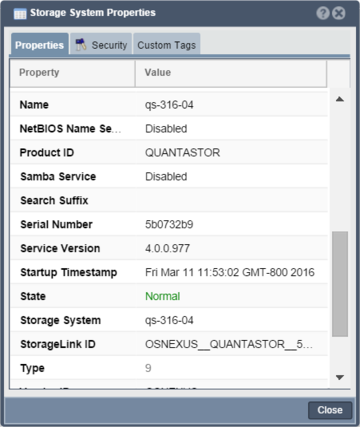 The QuantaStor web management interface enables IT administrators to manage all their QuantaStor systems via a single-pane-of-glass. 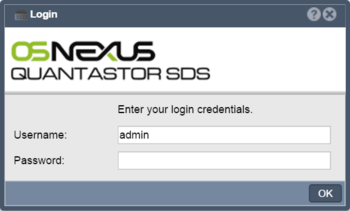 What's unique about QuantaStor's web interface is that it is storage grid based and built into every system/appliance so there's no extra software to install. The grid technology and architecture of QuantaStor enables the web (and REST/CLI) management interface for the grid to be available and accessible via all appliances at the same time and by multiple users. No additional software is required, simply connect to any IP address of any appliance within the grid via HTTPS to connect and manage the storage. Storage grid technology enables management of QuantaStor appliances across sites thereby reducing cost of managing, maintaining, and automating multi-site storage configurations, aka, storage grids. 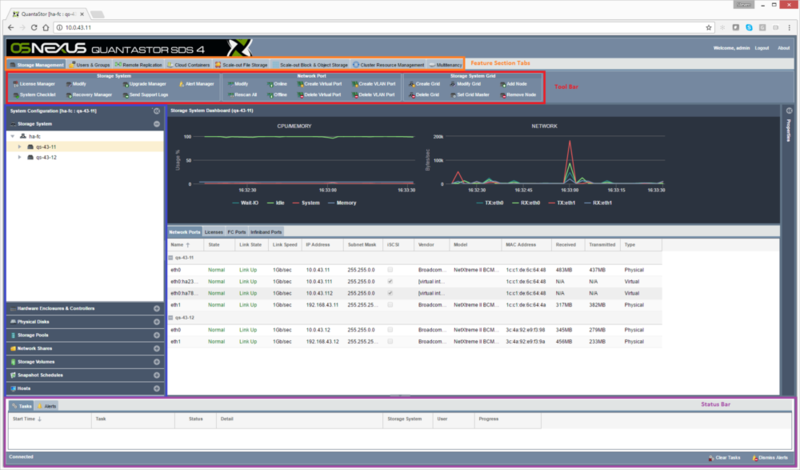 When you initially connect to QuantaStor manager you will see the feature management tabs across the top of the screen (shown in the orange box in the diagram below) including tabs named Storage Management, Users & Groups, Remote Replication, etc. These main tabs divide up the user interface into functional sections. The most common activities are provisioning file storage (NAS) in the Network Shares section and provisioning block storage (SAN) in the Storage Volumes section. The most common management and configuration tasks are all accessible from the toolbars and pop-up menus (right-click) in the Storage Management tab. The toolbar (aka ribbon bar, shown in the red box) is just below the features management tab with group sections including Storage System, Network Port, Storage System Grid, etc. The toolbar section is dynamic so as you select different tabs or different sections in the tree stack area the toolbar will automatically change to display relevant options to that area. The tree stack panel appears on the left side of the screen (shown in the blue box in the screenshot/diagram below) and shows elements of the system in a tree hierarchy. All elements in the tree have menus associated with them that are accessible by right-clicking on the element in the tree. The center of the screen typically shows lists of elements based on the selected tree stack section that is active. This area also often has a dashboard to show information about the selected item be it a storage pool, storage system or other element of the system. By selecting different tabs and sections within the web management interface the items in both the toolbar, tree stack panel, and center panel will change to reflect the available options for the selected area. Although the QuantaStor web UI is all browser native HTML5 it has many of the ease-of-use features one would find in a desktop application. Most notably, one can right-click on most items within the web user interface to access context specific pop-up menus. This includes right-clicking on tree items, the tree stack headers, and items in the center grid/table views. This page was last modified on 21 March 2019, at 09:36.